This giveaway is now closed. Thanks for stopping by. The winner is Jennifer (#29). Congrats! Donate to the Nature Conservancy: For every “Save Planet Earth” tote bag sold, Disney Store will donate $1 to the Nature Conservancy with a goal of reaching $65,000. Each tote is made from seven recycled bottles and displays the green alien from Disney-Pixar’s Toy Story. Recycle: If you bring in six plastic bottles or aluminum cans to your local Disney Store, you’ll receive a free Friends for Change and Oceans branded hat on Earth Day (April 22, 2010) (while supplies last). The hats are made from six recycled plastic bottles. Teach Children About Conservation: Bring your kids to your local Disney Store on Earth Day (April 22, 2010) for an activity sheet based on the new Oceans film which will teach them how to reduce trash and waste in our lakes, oceans, rivers, and streams. Shop Sustainably: At the Disney Store, you’ll find Disney’s new Friends for Change apparel and their new “Save Planet Earth” collection. Disney Channel stars Jonas Brothers, Miley Cyrus and many more have come together as Disney’s Friends for Change, educating kids about activities that can do to help the planet. Their new apparel line includes 100% organic t-shirts in four unique styles, available exclusively at Disney Store. Their “Save Planet Earth” collection includes an exclusive line of new t-shirts made from 100% organic materials, reusable aluminum bottles, journals made from recycled paper and more. Spread the Word, Get Involved: Disney offers exclusive content and information to help you get involved this Earth Day and spread the word about simple things we can all do to preserve our environment’s resources. Watch exclusive Earth Day videos featuring Joe Jonas and Demi Lovato on Disney Living and the store’s Facebook page. A special message can also be seen at Disney Store locations, encouraging everyone to do their part to protect our waterways. Win It! One of you will win a Earth Day prize package from the Disney Store. 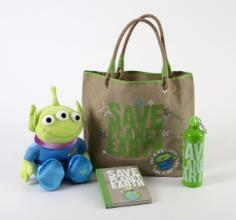 The prize pack includes a “Save the Planet” aluminum bottle, recycled tote bag, recycled journal, and Toy Story Alien Plush. Simply leave me a comment with another product (other than the ones listed above) that you like from the site (bonus entry if you find another green product!). Comments will close on April 29, 2010 at 11:59 PM PST. One comment per person, please (unless you do the extra credit). US residents only. Duplicates and comments not including the above information will be disqualified. Comments are moderated. If you don’t see your comment in a reasonable amount of time, send me an email. Bloggers and non-bloggers may enter. If you don’t want to leave your email address, please be sure to check back for my announcement on the winner. Please note that winners must respond within 48 hours of being announced/contacted or another winner will be drawn.Want an extra entry? Do any or all of the following and receive an extra entry for each one. I did not receive compensation for this post. Product samples were provided to facilitate this review and giveaway. Very nice! I might just have to go there on Earth Day. I’m a big fan of Disney anyway and think they could do LOTS more to aid sustainability but educating kids is a good start. My 5 year old and I might make that trip! Love the Earth Day Toy Story Alien Tee for Boys. So many great items on The Disney Store website. I like the Toy Story Space Alien Tree Planting Kit. The toy story shopping bag- large is a green product. I’ll put my bonus entry first. I found a Reusable Summer Fun Disney Character Tote. Very Cute! Kim M.
Now for my regular entry wish. I’d like to get the Minnie Mouse Infant Sleeper. Kim M.
My son would go nuts for the talking Lightning McQueen Super 6 Ride-On Car! Thanks for the chance. I love the Toy Story Space Alien Tree Planting Kit! What a cool idea! I think the Earth Day Toy Story Alient Tee for Girls (#10297OM) is adorable! Thanks for the review and giveaway! I also love the toy story space alien tree planting kit! I like the Disney Princess Eco Shopping Bag. I would love Disneynature: Earth DVD or Schoolhouse Rock! Earth DVD. Absolutely love the Stainless Steel Create-Your-Own Watch for Her …I think I would have to have it in pink with Eeyore. I also like the Patchwork Mickey Mouse Cosmetic Bag by World of Good. I like the Tree Planting Kit as well as the Toy Story Alien reusable tote. I like the Reusable Summer Fun Disney Character Tote. I liked the ”Change You Can Sea” Friends for Change Mickey Mouse Tee for Girls. It would be great for my granddaughter. For the bonus entry, I would pick Toy Story Space Alien Tree Planting Kit. This is something that would be fun for the grandkids to watch as well as adding another tree to the world. The Tree Planting kit is awesome. My daughter would like the Disney The Princess and the Frog for Nintendo DS. The Earth Day Toy Story Alien Tee for Boys is super cute! I like the ”Happily Ever After” Disney Princess Doll 8-Pc. Set — 11”. I like the ”Showdown” Lightning McQueen Polo for Toddler Boys. I love the Toy Story tree planting kit! I love the Disney Dollars!!! They are sooo cute!!! I like the Earth Day Toy Story Alien Tee for Adults (Item # 102956M ). I would love the Patchwork Sling Mickey Mouse Bag by World of Good. I like the Mickey Create-Your-Own Dozen Roses . Too cool! I like the ”Save Planet Earth” Toy Story Little Green Alien Mug. It would be great for my morning coffee. Thanks for the giveaway. Another product we like is the Stitch Plush Toy — 11” (Item # 200154P ). Thank you for the fun give-away. I love the Disney Patchwork Mickey Mouse Tote. I like the treeplanting kit! The alien tree planting kit is green! I love the Toy Story Space Alien Tree Planting Kit. I love the organic Mickey Mouse tote. Thanks! I love the U-Command WALL•E!!!!! I like the Swimming Ariel 12” doll. I like the Woody’s Round Up Toy Story Lego set. I like the girls princess pajama pals short set from disney store. I also like the Action Marvel Tee for boys. I love that Disney is involved with this great cause, some people will get involved just because of that. Awesome prize package! I like the personalized mrs. jumbo and Dumbo snowglobe! I like the cute Disney Princess Eco Shopping Bag! I like the Reusable Muppet Tote. My favorite is the Disney Princess Eco Shopping Bag. I love the Walt Disney Signature Summer Meadow Votive Candle — 6-Pc. !